It's a wedding designed for the most devoted Shark Week fan: a ceremony with the happy couple submerged in a 120,000-gallon shark tank at the Long Island Aquarium, protected by a cage, but nonetheless surrounded by dozens of majestic sharks and other fish. As friends and family watch from outside of the tank, the lovebirds exchange vows and share a first kiss like no other. Well, sort of. According to Darlene Puntillo, the aquarium's Marketing Director, the couples can't technically kiss through their scuba gear. Many choose to high five underwater, instead sharing their first kiss after they emerge from the depths of the tank. For the safety of the animals, the aquarium also strongly encourages couples to use fake rings that are tied to the cage for the ceremony: in the event that the rings are dropped, they won't become shark chum. Aside from the fact that the ceremony takes place underwater, with friends and family watching from the safety of an observation deck and listening through speakers, the Shark Dive wedding really isn't that out of the ordinary. "The only real difference is you have to take a shower and do your hair and makeup after the ceremony!" jokes Puntillo. Otherwise, the shark cage weddings stick pretty closely to the book -- whichever book you choose. The institution has hosted ceremonies of many different faiths, including an interfaith wedding, with both a priest and a rabbi submerged in the cage. The affair takes a more traditional turn after the ceremony. 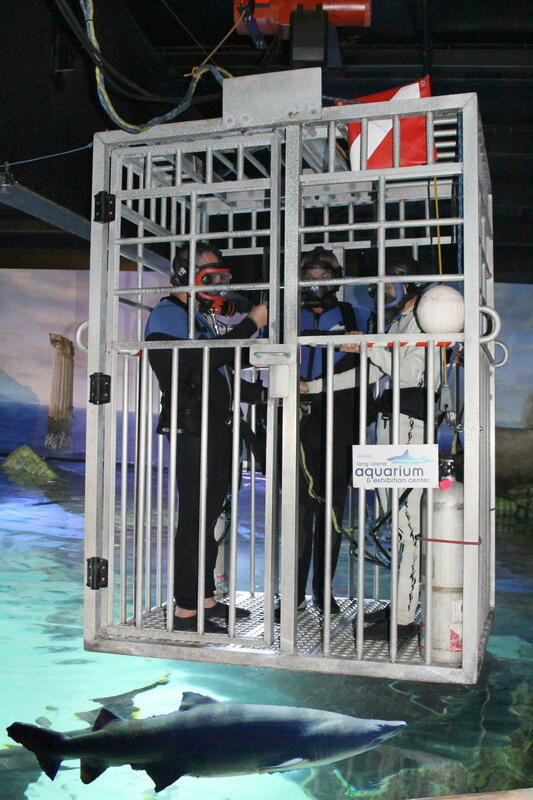 Once the newlyweds have time to shower and dress for the reception, everybody ushered into one of the aquarium's more conventional venues for the afterparty. 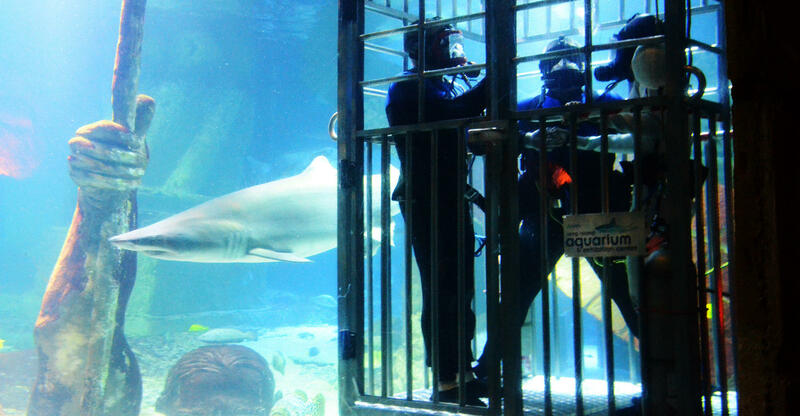 "Although it has become somewhat routine for our staff, seeing a wedding ceremony in a shark tank is uncommon for most people. Guests seem to really enjoy being a part of such a unique ceremony and its one most will never forget," adds Puntillo.